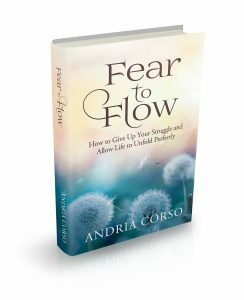 Fear to Flow - Andria Corso & Co.Andria Corso & Co. Fear to Flow – #2 Hot New Release on Amazon in 2016! Are False Fears Holding You Back From Living Your Most Authentic Life? Imagine if you there were no “false” fears running through your brain… if you weren’t afraid of failing, of what other people thought, of rejection, disapproval, or uncertainty? What would your life be like if, instead of making decisions because you feared those above things, you made decisions that felt like freedom and were rooted in trusting yourself and where your heart and gut were leading you? What would our society be like if we stopped living in fear…? If, instead of being fearful of those people and situations that are different from us or that we don’t understand, we embraced those differences? What if, one person at a time we could stop feeding our culture of fear? Fear to Flow is the first step on your journey. The first step towards giving up your struggle, towards releasing false-fears and to stepping into a life of Flow: Freedom, Love, Openness, and Love. 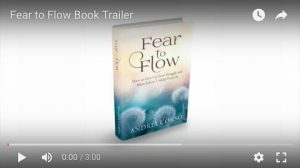 What are others saying about Fear to Flow? -Lynne Klippel, Best-selling author of Overcomers, Inc.
“A Spiritual Memoir which speaks directly from Andria’s heart into yours. Her teachings are a brilliant alchemy of realness, rawness and zero righteousness which will resonate with those who are ready to leave the “right way” behind and step into a new reality that is full of magic, mystery and miracles. Each page turns like a decadent box of chocolates, you tell yourself you’ll only have one more but before you know it, you’ve devoured the whole box. And just like any good chocolate, this book is good for the soul. No matter where you might be on your Spiritual Journey, you will find yourself in Andria’s words and teachings. Who can’t relate to being shackled to a lifetime of fears, living a life based on pleasing others or discovering that all you have ever believed to be true, really isn’t and has only been getting in your way? Andria shines a light on the things that we must all let go of (fear, worry, struggle, control) if we are ever going to awaken our Divine Self and live a life of energetic expansion, freedom and flow. Allow yourself the gift of Andria being your guide as she teaches you to live and love your life with ease, joy, openness and wonder. Download this free guide on How to Kick-Start Your Career Transition. Feeling stuck and like you’ve hit a dead-end in your career? Trying to figure out what’s next? Download this free guide on How to Kick-Start Your Career Transition and begin to create and find meaningful work. You can LOVE Mondays! Start living a life you love.